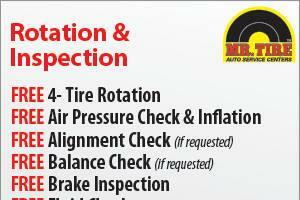 To get a FREE Tire Rotation and Inspection at Mr. Tire print and redeem this coupon.This coupon is good for FREE 4-tire rotation, FREE air pressure check and inflation, FREE alignment check (if requested), FREE balance check (if requested), FREE break inspection, FREE fluid check, and FREE wiper blade check. *See store for complete details. Most vehicles. Not valid with other offers.